Philosophy wouldn't seem to lead naturally to poetry, but it can if you find the right philosopher. For Cincinnati-based poet Matt Hart - who will be reading from his work on Saturday at Rozz-Tox along with poets from the Quad Cities edition of the national journal Locuspoint - it was the 20th Century Austrian philosopher Ludwig Wittgenstein. Hart fell in love with poetry as an undergraduate at Ball State University, but he studied philosophy. Pursing a graduate degree in the subject at Ohio University, though, "I really bought Wittgenstein hook, line, and sinker. As a result, I quit doing philosophy. One of his main ideas is that philosophy is a sort of mental illness; if you understand him, you quit doing it." And Wittgenstein offered an alternative to philosophy's relentless rational argument, writing that "philosophy ought really to be written only as a form of poetry." Hart, in a phone interview this week, said that while their approaches are different, philosophy and poetry often share a common goal. The initial appeal of philosophy, he explained, was that "this was the place where we get to really think about meaning and existence, and solve the world's problem rationally. [But] what I realized was that the biggest problems and the things that are most crucial to our existence are always going to be inexplicable and mysterious." The best way to deal with that irrationality, he said, is irrationally. Hence, poetry. Hart gave the example of the phrase "diamonds in the sky." People know what the individual words mean, he said, and they have a sense of their purpose as figurative and evocative language. But when you start to consider the phrase literally, "suddenly it starts to become really strange. ... There's a baffling quality to it." He summarized: "Poetry is really just the artistic misuse and abuse of the language we already know. ... You just need to take the language that you already have before you and destroy it." Since abandoning philsophy, Hart earned his MFA in poetry, launched the publication Foklift, Ohio: A Journal of Poetry, Cooking, & Light Industrial Safety, and published four books of poetry - the most recent being Sermons & Lectures Both Blank & Relentless. He also teaches at the Art Academy of Cincinnati. His Rozz-Tox reading, Hart said, will largely be drawn from Sermons & Lectures, a book with twin origins that, it should come as little surprise, would seem to have little in common. First, he said, he was asked to write a series of essays on music. "I got stuck," he said. "Instead of writing the essays, I decided to teach a class ... where we use punk-rock lyrics as lenses for looking at other kinds of literature." That class was a springboard to poetry related to his long history in bands. The second inspiration was an ancestor, a minister who specified in his will that he would be stood up at the pulpit in his coffin with his eyes open - a warning of sorts to his parishioners. Hart said that he recognized that "there's not really that much difference between being a punk-rock vocalist and a hellfire-and-brimstone preacher." The book, he said, represents the collision of poetry with the titular - and obviously more didactic - types of speech, and it explores issues of faith, love, and existence. Hart characterized previous work as "contemporary surrealism, but very based in the domestic circumstances of my life." Sermons & Lectures, he said, is much different, "a really noisy book; it's really loud. There are lots of things clashing. There's certainly a lot of music to it. It's very rhythmic; it's repetitive in ways that the other work is not." 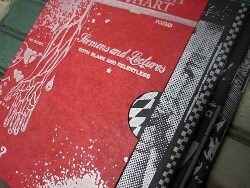 A companion piece is an album by Hart's band Travel - Blank Sermons ... Relentless Lectures - that appropriates poems from the book for lyrics. And if poetry readings sound staid, know that Hart brings his rock background to poetry. That's evident in his touring, but also in his approach to the work. "I enjoy being able to try to give the poems life in the air as opposed to just on the page," he said. "When I read these poems [from Sermons & Lectures], I'm throwing the poems at people, and people throw them back at me if I'm lucky and effective." Joining Hart will be at least four poets represented in Locuspoint: Quad Cities, which was published January 31. Locuspoint was created by Charles Jensen and, over the past five years, has issued three volumes, each with previously unpublished poetry exclusively from a handful of American places. The Quad Cities join major cities and college towns on the Locuspoint map, an obvious outlier along with Olympia, Washington, and the entire state of Maine. The Quad Cities portion of the volume was curated by E. Marie Bertram, a fellowship instructor at Augustana College who had contributed to the debut of Locuspoint, representing St. Louis. She said that she approached Jensen about including the Quad Cities. "I woke up one day, and I thought, 'You know what? It would be very cool if we could have a place like the Quad Cities represented in Locuspoint.' ... We don't really have many places that people maybe haven't heard of on the map." Jensen agreed, and Bertram began contacting poetry friends and acquaintances. Work by Bertram, Neal Allen, Ryan Collins, Sarah J. Gardner, Farah Marklevits, Lucas A. Street, and Amber L. Whittle is included. Bertram said that while Locuspoint is place-specific, the poems are not. She said the collection should be seen as no more than "a contemporary reflection of poetry that's coming out of the Quad Cities." But she added that putting the pieces side-by-side might generate new energy and meaning: "Maybe you'll see the poems in a slightly different light than you would otherwise. ... You might read them differently ... ."
She also said the Rozz-Tox event will bring together poets ranging from college students featured in Locuspoint to Hart, and everything in between. Collins - who organized the Rozz-Tox event - said that Hart contacted him about doing a Quad Cities reading, and he thought pairing him with Locuspoint poets would be a "nice dovetailing." 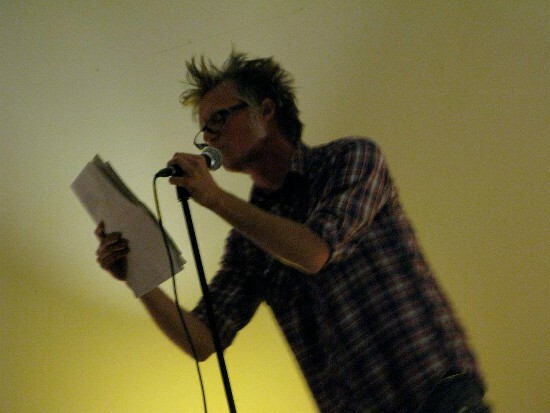 Matt Hart and the poets of Locuspoint: Quad Cities will read beginning at 8 p.m. on Saturday, March 10, at Rozz-Tox (2108 Third Avenue, Rock Island; RozzTox.com). Admission is free, but donations are encouraged.